This team is open to anyone who is random. This is my first team. Chaos shall reign here. "This team is open to anyone who is random. " You may join even if you are on another team. It means if you are on a diffrent team you can join this one without leaving the team you are on. Besides chaos needs to be represented too. or dress in a chicken suit and dance in potato salad random? or the water melons on a roof with a duck meet me in five minutes random? "are you talking like alignment random or dress in a chicken suit and dance in potato salad random? or the water melons on a roof with a duck meet me in five minutes random? " We are a chaotic place. All kinds of random are accepted. So you want to join or not? We shall wait and plot. We are doing well for our first day. Chaotic day today. I just love it. It's how people feel at school in general. Homework is the worst invention since the advent of lunacy. Beast wars the agenda part 1-3. OMG BEAST WARS!!!!!! BEST TRANSFORMERS SERIES EVER!!!!!! well, aside from Beast Machines. Transformers hasn't come out in England yet? So you are trying to orginize chaos? WTF?! I got more and I know the episodes percisely. I have the every Beast Machines episode on DVD. Beast wars optimal situation. Megatron shot G1 optimus prime in the head in prehistoric earth which will cause evrey maximal to never exist and make the autobots lose the war so the maximals try to fix optimus prime. MEGA. Don't do it. he'll figure it out himself. "MEGA. Don't do it. he'll figure it out himself." why are you always there when i ask?! AHHH! Are you octagon enigma? " Heck no. Enigma's gone and probably never coming back. Besides I'm not spoiling the surprise for you. ok, the place where people can see the different version of me is my image gallery. then count to number 14 and that pic will help you figure it out. happy? Waspinator is fate's chew toy. LOL. His luck is always bad. I hate waspinator. what the heck is with talking in thrid person!? @CC: DUH! Jeez, told you it was easy. In every beast wars episode I remember he always lost at least one limb and normally is blown apart. yea. told you the riddle was easy. Ben 10 had a werewolf form, and that was easiest for people to tell it was me without straight out telling them. So cyro how long are you going to stay as dean? lil while. He's my main good guy right now. I'll probably change into Cryo sometime today. 13 minutes since last post on here lol. Transmetal 1 megatron. He turns into a mettallic t-rex that has V/STOL engines and inline skates for more mobility in beast mode. Beast wars the agenda part 1-3." 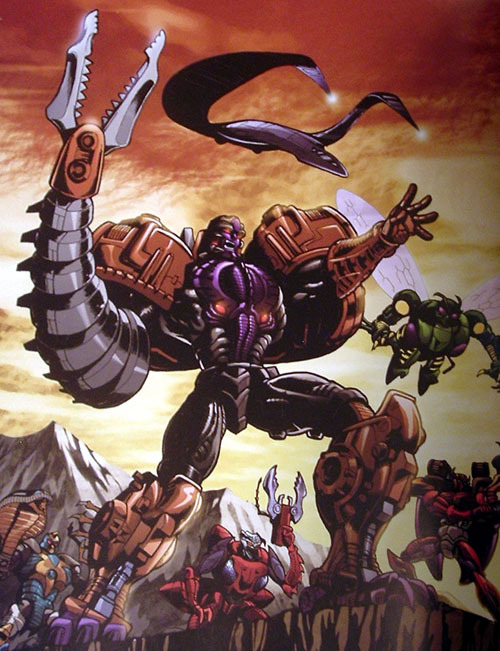 "http://images.wikia.com/transformers/images/8/86/Megatronbw.jpg Transmetal 1 megatron. He turns into a mettallic t-rex that has V/STOL engines and inline skates for more mobility in beast mode." Yeah. I know. Cheeto has lil rcket booster things that pop out of his back, ratttrap's legs turn into wheels, and Optims has that three formed transformation thing. And Depth Charge can turn into a subamrine thingy. I know alot about this series. Both the dragon and transmetal T-rex modes are pretty awesome.